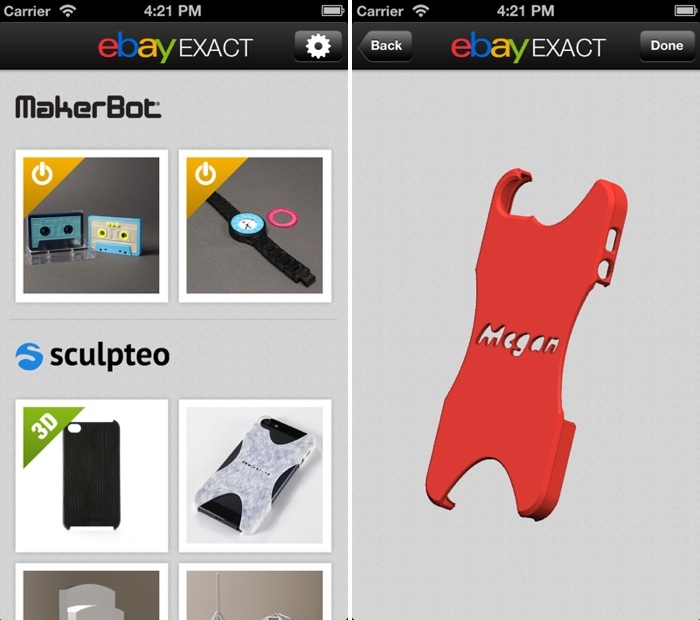 eBay has launched a new app that allows users to order and customize a number of printed objects from companies like MakerBot, Sculpteo, and Hot Pop Factory. Items available from eBay Exact range from jewelry to personalized figurines to iPhone cases. - Bring your style to life. Choose from a variety of materials, including plastics, wood and metals. Use the engraving feature to further customize your product. - Be the first to use new technology to create one-of-a-kind iPhone cases, jewelry, and figurines based on self-portraits. - Build your collection. Whether you love jewelry or figurines, eBay Exact allows you to create as many unique products, exactly as you like, based on your personal desires and preferences. Items ordered from eBay Exact have a wide range of prices. For example, a simple iPhone case is priced at $25, while a figurine costs $150 and a ring costs up to $350. Ordered items are processed through Paypal and shipped within seven to 14 business days. I want to print my own MacBook Pro 17" retina display. I can't help but feel disappointed that the prices don't seem to be any cheaper than their mass-manufactured counterparts. Not sure I follow... why would you think custom single-copy products would be anything but more expensive than mass market counterparts? So is the idea behind this that 3D printing companies get to sell their goods through a major outlet, eBay, while consumers get to buy 3D printed products without needing to invest in a 3D printer? It's a good idea, and its presence will be a good thing, but I can't help but feel disappointed that the prices don't seem to be any cheaper than their mass-manufactured counterparts. Because the components are less expensive. 1KG is enough to make about 10 iphone cases, which work out to $4.80 each. So, if they sell for $25, that is a $20.20 markup. This would mean that after about 140 cases, everything is pure profit. So, once this point has been reached, they could easily drop the price by $10-$15 and still make a nice chunk of change. But a mass produced item is going to sell higher quantities, meaning they can cut the margins lower. The cost of producing/packing/shipping single items by hand is going to be more expensive then doing it all at once on a large scale. I think once more people have the capability the price will fix itself, but right now most people with a 3D printer don't want to spend all day printing iPhone cases to make $20/pop. So 140 cases would be about a month of "full time" work (You can be doing other things, but you physically have to be around the printer to refill it.) for $2800 profit. Not bad if you have a 3D printer laying around, but you aren't going to be making a living even at the $20 markup. Charge less and it becomes a terrible deal, you are essentially giving your time and your 3D printers time away nothing. You say this and then describe the cost structure of machine and raw materials for the custom parts, but don't address the mold/material cost of mass produced and you don't address any differences in marketing/support/overhead costs. Good explanation of why they could choose to undercut mass-produced competition but without the full comparative cost structure of both models it's meaningless.. There are assumptions on your part that aren't correct. The Makerbot branding belongs to Stratsys, one of the largest manufacturers of 3D printers and printing services in the business. They aren't making these on a Replicator 2. The Stratasys machines sell into six figures. These parts aren't being printed on Reprap style machines. These are high end industrial machines. A consumer machine like a Replicator 2 isn't capable of the material range or the speed of an industrial machine. As others have posted, it's not "pure profit". Such statements show a lack of understanding in how a business, any business including home based business work. There is software involved in not only the market integration to ebay but in the manufacturing space as well. If one were to download the app, they would see that for the phone case item is customizable by not only adding a name but in also changing the the properties of the edges of the case. There are tools like Autocad 123D but they require a more than passing knowledge of 3D modeling and these products are aimed at people that don't know how or even want to model objects. Some manufacturing business models sell the finished product at about five times the cost of material. Also custom products are able to fetch a premium markup for the cachet of having something unique (or at least the perception of being unique) or something that is made with input from the end user. In fact it's a fundamental pillar of that business model. While you are entitled to an opinion, it's not well informed with regards to what it takes to run a successful business or the mechanics and business models used in modern manufacturing. Apple PLEASE bring back the 17" MacBook Pro! Very cool! Hopefully this will succeed as a way for individual "makers" to reach the world with unique niche products that could never otherwise get manufactured.